I am Myrna looking for any of the following job positions: caregiver for elderly, child caregiver / nanny, and or office/housekeeping job positions. I am compassionate , honest, patient, flexible and likes to work with both children and elderly as well as can do house or office cleaning . I hope my years of experience will help me do my future job better and I am willing to learn and adapt to new things more on my field of work for the benefit of the clients/ families whom I am working with. I appreciate a chance of interview. Thank you..
Are you looking for Cleaning Help or a Housekeeper in the Toronto Area? TheNannyPages.com is an online agency servicing businesses & families in the Greater Toronto Area. 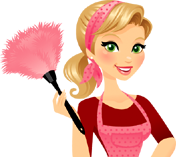 Browse profiles of Cleaners & Housekeepers looking for work. Live in, live out, full time, part time, temporary & weekend help available. Post your job description and let interested candidates contact you or you can contact them. TheNannyPages.com makes finding the cleaning and housekeeping help you need easy & economical. JOIN TODAY!